I've discovered a new, to me at least, brand this month which is Mio. I got a small tube of Workout Wonder in a Cult Beauty gift with purchase and have become obsessed with it. It's a invigorating muscle motivating gel which you apply pre and post exercise. I tend to use it after working out mostly as it feels a bit strange to apply it before if you're just going to sweat it off anyway. The thing I like the most is the peppermint scent, it smells amazing! It's really strong and when I apply it the scent alone just wakes me up and I feel like I've got loads of energy especially if I've just finished exercising. It helps to increase circulation and soothe your muscles which helps to ease aches the following day. With the Mio box from Latest In Beauty you get a £10 gift voucher so I went ahead and bought the full size along with Liquid Yoga. Liquid Yoga, why haven't I tried this before? Seriously this stuff is amazing! You pour a bit into your bath and then sink in and relax. It's like nothing I've ever tried before! It's an oil so it's extremely moisturising, I do shower gel it off so it's a bit less intense once I get out, and the lavender scent is amazing. Not only is it an incredibly relaxing scent but the arnica and epsom salts also help to relieve stiff and achy muscles. Despite being in a warm bath you sort of get this cold feeling from it as well which is really weird but cool at the same time. To wash off the oily residue from the Liquid Yoga I've been using the Rituals Ice Shower Gel. When you smell this in the tube it smells straight up of mens cologne but when you actually use it this scent disappears and you can really smell the mint. You wouldn't think it but it works really well with the Liquid Yoga scent. As this is so refreshing and really helps to wake you up it was perfect when we had the week of really hot weather in the middle of the month. Another product that was perfect in the hot weather was balance Me Hydrating Face Mist. This is my everyday toner of choice recently but during that week I was constantly spraying this on my face to cool down. It's very refreshing but is also helping to keep my skin hydrated and soothe my skin if it was a bit irritated. My final favourite from this month is the Red Carpet Manicure nail polish in Violetta Darling. I've found it quite hard to find colours that I normally wear from the RCM range but this one is spot on. It's a light purple and works well for summer or winter and all the other months in between. The gel formula means I can get weeks out of my manicure unlike the one or two days I get from normal nail polishes. The kit and nail polishes are expensive but if you add up how much a salon visit would cost then it's quite a bargain. Workout Yoga sounds like a great after gym product! I usually just do with a warmshower post workout and tht helps me! Peppermint sure sounds tempting though! 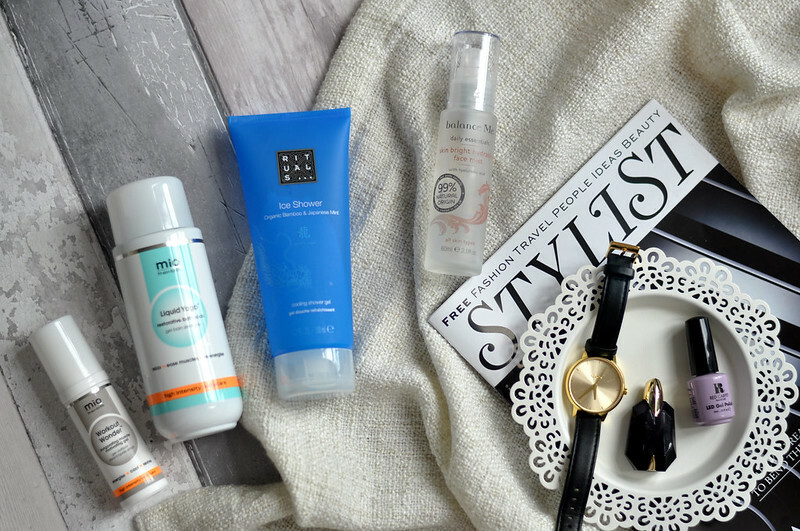 I love mio products.. You beauty discovery has a mio beach beauty box! !